In one sense, every discussion about ethics is a discussion about boundaries. 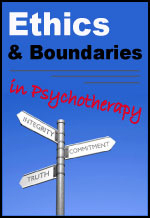 In a larger sense, moreover, the psychotherapeutic process itself is all about boundaries – boundaries that join therapist and client, and boundaries that separate them; boundaries that define what is to be part of therapy and what is not; boundaries that the client may have compromised and must reinstate. 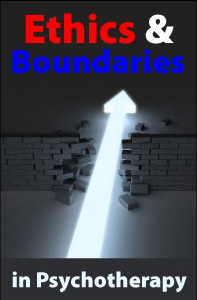 It is this latter point that makes the issue of boundaries in psychotherapy one of the fundamental agendas for any therapeutic process: the fact that many clients find themselves in adverse situations they themselves have created by failing to establish effective boundaries. The ethics component is the therapist’s roadmap for providing assurance that therapeutic boundaries will be established and maintained throughout the client’s therapy experience. The concept of boundaries is not limited to professional relationships. Nations, tribes, families, and individuals all have boundaries. Robert Frost wrote “good fences make good neighbors.” Cultures have widely differing understanding of boundaries, and when people from one culture move to a new environment their sense of boundaries may evolve, more closely mirroring the beliefs of the place where they now live. Boundaries are the limits that allow for safe connections between individuals. A boundary is that defining space which clarifies “you” and “me.” Our understandings of what are acceptable boundaries grow out of our family of origin. A healthy boundary allows an individual to relate with genuineness to others. Persons with healthy boundaries know how to provide for their own personal privacy and safety (and by extension, that of their young children). Appropriate intimacy and the achievement of trust is possible in relationships because there is no fear of losing “self” in establishing connections with others. Ethics & Boundaries in Psychotherapy is a 3-hour online continuing education (CE) course that gives psychotherapists the tools they need to resolve the common and not-so-common ethical and boundary issues and dilemmas that they may expect to encounter in their everyday professional practice. Among the topics discussed are definitions of boundaries; resolving conflicts between ethics and the law; boundary crossings vs. boundary violations; multiple relationships; sexual misconduct; codes of ethics of the APA, NASW, NBCC, and AAMFT; privacy and confidentiality in the age of HIPAA and the Patriot Act; ethics issues with dangerous clients; boundary issues in clinical supervision; ethics and cultural competency; technology and ethical boundaries; fees and financial relationships; termination of psychotherapy; and a 17-step model for ethical decision making. 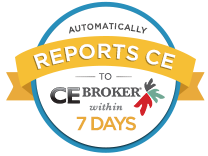 * This course satisfies the ethics requirement for biennial relicensure of Florida mental health professionals. The Florida Board of Clinical Social Work, Marriage & Family Therapy & Mental Health Counseling requires that licensees complete a 3-hour course on ethics and boundary issues each renewal cycle as part of the 30-hour continuing education requirement. Professional Development Resources is approved as a provider of continuing education by the Association of Social Work Boards (ASWB #1046); the National Board of Certified Counselors (NBCC #5590); the American Psychological Association (APA); the National Association of Alcoholism & Drug Abuse Counselors (NAADAC #000279); the Florida Board of Clinical Social Work, Marriage & Family Therapy, and Mental Health Counseling (#BAP346); the California Board of Behavioral Sciences (#PCE1625); the Texas Board of Behavioral Sciences (#114); the South Carolina Board of Professional Counselors and Marriage & Family Therapists (#193); and the Ohio Counselor, Social Worker and Marriage & Family Therapist Board (#RCST100501). Clear boundaries are necessary in order for both therapist and client to understand the nature and purpose of their relationship with each other. Confusion about the therapist-client relationship can only interfere with the goals and process of psychotherapy. A client who comes to view the therapist as friend, lover, or business associate – anything other than his or her source of professional help – is likely to have difficulty making use of the therapeutic alliance. In consideration of the implicit power imbalance that exists between therapist and client, the burden of responsibility for maintaining boundaries always falls upon the therapist. According to Nancy Ellett Allison, boundaries are the limits that allow for safe connections between individuals. A boundary is that defining space which clarifies “you” and “me.” Our understandings of what are acceptable boundaries grow out of our family of origin. A healthy boundary allows an individual to relate with genuineness to others. Persons with healthy boundaries know how to provide for their own personal privacy and safety (and by extension, that of their young children). Appropriate intimacy and the achievement of trust is possible in relationships because there is no fear of losing “self” in establishing connections with others. Persons with unclear boundaries establish the “locus of control” outside themselves. They may allow others to define who they are, what they think, where they go. Intimacy for such individuals can easily lead to abuse if those with whom they relate prove untrustworthy. People with rigid boundaries, on the other hand, may be generally distant, unconnected, and lonely. These individuals have found “safety” through rejecting connections with others. Frequently these responses are a result of past abuse or emotional trauma. Intimacy and trust seem beyond reach. In either case, there is the potential for damage if clear and healthy boundaries are not maintained by the therapist. Nearly every component of professional ethical behavior has something to do with boundaries. Privacy and confidentiality, multiple relationships, conflicts of interest, self-awareness, therapy with families and couples, personal, cultural and religious values, duty to warn, duty to protect, professional accountability, supervision and peer consultation, fees and fee setting are all permeated with boundary issues. Such issues transcend the domains of therapist orientation, professional ethics, and law. Thus virtually every professional organization and regulatory board that sets forth standards for the practice of psychotherapy has a published set of legal and/or ethical guidelines describing the boundaries of professional practice.